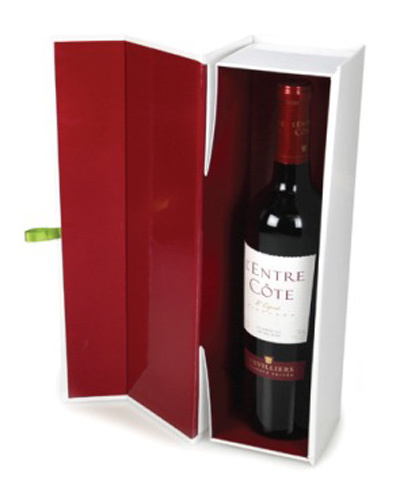 Collapsible Magnetic Gift Box are idea for wine and storage of a variety of products. Our 2 bottle boxes come with inserts and plastic handles. 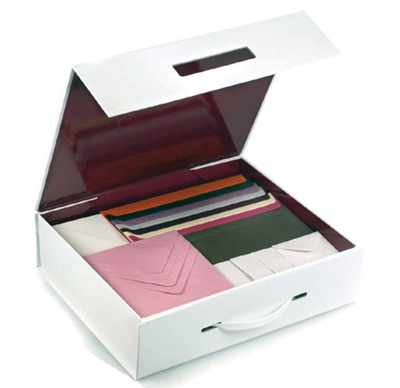 These 1 piece folding boxes are made from heavy cardboard that are beautifully wrapped with white glossy paper outside and a glossy burgundy inside. Note the minimum order for each is in parenthesis in the quantity column. Orders will need to be in multiplies of this quantity. Price listed is per each wine box. 13-1/2" X 3-1/2" X 3-1/2"
FOLDING WINE BOXES / FOLDING STORAGE BOXESBR>Design for wine & spirits but also idea for other products. Glossy white out side and glossy white inside. Make from very heavy cardboard to hold just about any weight. FOB FACTORY...ALLOW 2 days to ship. Glossy white out side and glossy garnet inside. 12-1/2" X 3-1/4" X 3-1/4"
Glossy white out side and glossy burgundy inside. Glossy black out side and glossy black inside.